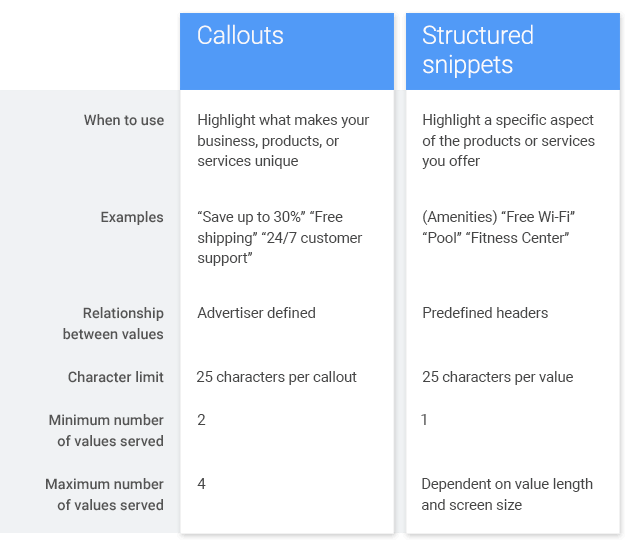 How structured snippets differ from callout extensions and how Opteo will help you manage them. Like all ad extensions, structured snippets are extra elements you can add to your text ads for free. Structured snippets allow you to include additional details about your business under twelve headers. Generally, callouts are best suited for the account level, as they tend to be top-level facts about your business. Structured snippets' headers allow for more specificity and customisation, ideal for the campaign and ad group levels. How will structured snippets improve my ads' performance? Like sitelinks and callout extensions, structured snippets will give Google an opportunity to extend your text ads with an extra line of information. This extra line will allocate you more visual real estate on the results page and increase your relevancy. Greater relevancy increases your CTR relative to other competing advertisers, which in turn increases your Quality Score. How does this improvement task work? You'll see this improvement if we find ads missing structured snippets. You might have applied extensions at the campaign level, but forgotten to copy them over to a new campaign, for example. Clicking Enter Structured Snippets will let you create, edit and push your new snippets right from the app. You'll also see examples of snippets and a list of campaigns currently missing snippets. We'll set new snippets at the account level, so all new campaigns and ad groups benefit by default.